MSNBC's Joe Scarborough blames Sarah Palin for the GOP's failure to capture the Senate because of her efforts in drafting candidates who were defeated in Delaware and Nevada. "But for Sarah Palin, the Republican Party would control the Senate right now," the former Florida congressman stated on ABC's "The View" Thursday. "She's not a national ticket," he added when the conversation turned to her possible 2012 Presidential run. "Who thinks seriously that she can get 51 percent?" 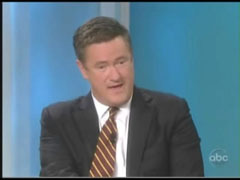 Scarborough was frank with his words on the hit daytime show, discussing Sarah Palin, colleague Keith Olbermann's suspension, and why he thinks his "Morning Joe" program is a success. He praised his own show for its "transparency," that the audience knows the political views of each of the hosts. "People know I was a Republican congressman. People know that Mika is center-left, that her father worked for the Carter administration. And I think that actually instructs people," he bragged. The MSNBC anchor added that he thinks total neutrality in a journalist is a "total sham." "I want to know what your views are if you're reporting on a story," Scarborough claimed, priding himself for his willingness to both defend and criticize the GOP. He certainly exercised the "critical" side on Thursday, hitting Sarah Palin as a cultural phenomenon but not a political figure, and predicting that she wouldn't be able to beat Obama in 2012. Yet back in 2006, Scarborough's liberal MSNBC colleague Andrea Mitchell called his bluff for being overly a pro-Democratic bias to his coverage. He lauded himself for being critical of the GOP, in order to cast himself as a down-the-middle pundit. But Mitchell remarked that "I think Joe has been too pro-Democrat, myself." SHERRI SHEPHERD: What about Sarah Palin – the thing about Sarah Palin, she has been very, Sarah Palin has been very influential in getting folks in, everybody was watching her. What do you think she's got planned for 2012? JOE SCARBOROUGH: A congressman said, and I think he's right – that but for Sarah Palin, the Republican Party would control the Senate right now. Sarah Palin got involved in Delaware with disastrous results. SCARBOROUGH: Sarah Palin got involved in Nevada, she got involved in Alaska. And it went well in some states in the deep South, but it didn't – she's not a national ticket, and people are distracted by the fact that she draws a lot of attention. But in the end, maybe she wins Iowa, but then she goes to New Hampshire and loses. JOY BEHAR: Why can't they control her a little bit? They can't. SCARBOROUGH: Why can't anybody control you, baby? BEHAR: I'm not running. Nobody can control me. BEHAR: I'm not running for anything. SCARBOROUGH: Who thinks seriously that she can get 51 percent? She's selling a lot of books, she's got a lot of people watching her on TV, but right now she's a cultural figure now, she's not a political figure. BEHAR: Don't you think, though, that the fact that she keeps her hat in the ring as a potential candidate keeps her making more money, selling more books, doing more shows – if she says "I'm out of the race completely," noone would be as interested in her, right? BARBARA WALTERS: Can I – can I ask you about something that just happened last week? And that is your colleague Keith Olbermann who was suspended for a short period of time, because he made campaign contributions. It also came out that you had made campaign contributions, you did it to the Democratic candidates. Supposedly, you asked permission and he didn't. What do you feel about this whole line of, what, journalists? Are you a journalist, or are you a pundit -- what's your opinion on this whole thing? SCARBOROUGH: I don't know what I am. I'm still trying to figure it out. SCARBOROUGH: I know what you're talking about. Again, that's going to be up to the front office to figure out what they want to do. It's a fascinating conversation, because the rules have changed over the past 10-15 years, and as far as me giving contributions, I did. Gave it to a longtime friend, and I got permission first. HASSELBECK: Does it matter at all, I mean your history, former congressman in Florida -- I mean does that kind of factor in to how they would define you at all? SCARBOROUGH: We would have to ask for permission now, too, but I would never ask for permission, because in this case – like let's say I was going to interview Nancy Pelosi, if I contribute to any Republican across the country, I'm working against Nancy Pelosi's interest. BEHAR: It's either right or wrong, whether they give you permission or not. SCARBOROUGH: Well, I mean there are guidelines and they're not guidelines. SCARBOROUGH: But I think the thing that works on our show is that we're transparent. People know I was a Republican congressman. People know that Mika is center-left, that her father worked for the Carter administration. And I think that actually instructs people, and they come on the show – when I criticize Republicans, it is a Republican criticizing his own party. When I say Barack Obama's doing something right, it's the same thing. And so the transparency's good. And Barbara, I – again, I want to know what your views are if you're reporting on a story. I want to know – and I'll tell you the one thing that I do think is a total sham, and I know you've heard it all the time too – journalists will say, "Well, you know, I'm an independent, I don't register," or "I don't vote," or "I'm an independent." I hear that all the time. I'm like, "please." SCARBOROUGH: Please. Maybe you don't, but I want to know what your worldview is. So I would just like to say that – I think "Morning Joe" – I think you're doing everything right, I think Mika's doing everything right, and we are always delighted to have you here, and I'm not kidding, that's true.